The U.S. Environmental Protection Agency has refused to pay more than $1.2 billion in claims filed against it in response to the Gold King Mine spill, reported the Farmington Daily Times. The EPA says the Federal Tort Claims Act prevents the agency from paying claims the result from “discretionary” government actions. Congress passed the law to allow government agencies — and in this case, contractors working on their behalf — to act “without the fear of paying damages in the event something went wrong while taking the action,” according to a press release from the EPA. An EPA agency official said paying the claims would discourage such cleanup efforts in the future. The EPA says the work conducted at the Gold King Mine near Silverton, Colo., is considered a “discretionary function” under the law. 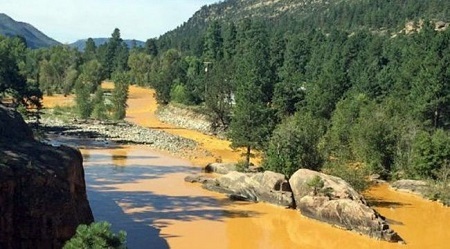 Contractors on Aug. 5, 2015, breached the mine, which released more than three million gallons of toxic wastewater into a tributary that feeds the Animas River, which ultimately flows into the San Juan River and Lake Powell. New Mexico Attorney General Hector Balderas, a Democrat, accused the EPA of revictimizing the state and the Navajo Nation by not taking full responsibility for triggering the spill of 3 million gallons of toxic wastewater, reported NBC 12 News. Sens. Tom Udall and Martin Heinrich, New Mexico Democrats, and Rep. Ben Ray Luján (D-N.M.) issued a joint statement saying they would continue pushing for legislation to hold the EPA accountable. They also said it would be up to the courts to determine whether the EPA’s defense is legitimate. “We are outraged at this last-ditch move by the federal government’s lawyers to go back on the EPA’s promise to the people of the state of New Mexico — and especially the Navajo Nation — that it would fully address this environmental disaster that still plagues the people of the Four Corners region,” the statement reads. An EPA official says 73 claims related to the mine spill were filed under the Federal Tort Claims Act. Four were from governmental agencies and the rest were from individuals and companies. The claims totaled more than $1.2 billion, though the official said the federal agency did not evaluate the legitimacy of the claims and some were vague and for “extraordinarily” large sums. Those who filed claims have six months from the date of denial to challenge the decision with the U.S. District Court. Photo: The now-polluted stream of Animas River ultimately flows into the San Juan River and Lake Powell. Source: theindigenousamericans_6i2sru.